Blade length : 68.2 cm or 26.9 inches. Sori : 1.8 cm or 0.7 inches. Width at the Kissaki : 2.39 cm or 0.94 inches. Kasane : 0.7cm or 0.26 inches. Shape : The blade is Suriage, cut shortened and folded the signature. Wide and thick firm looking Katana. 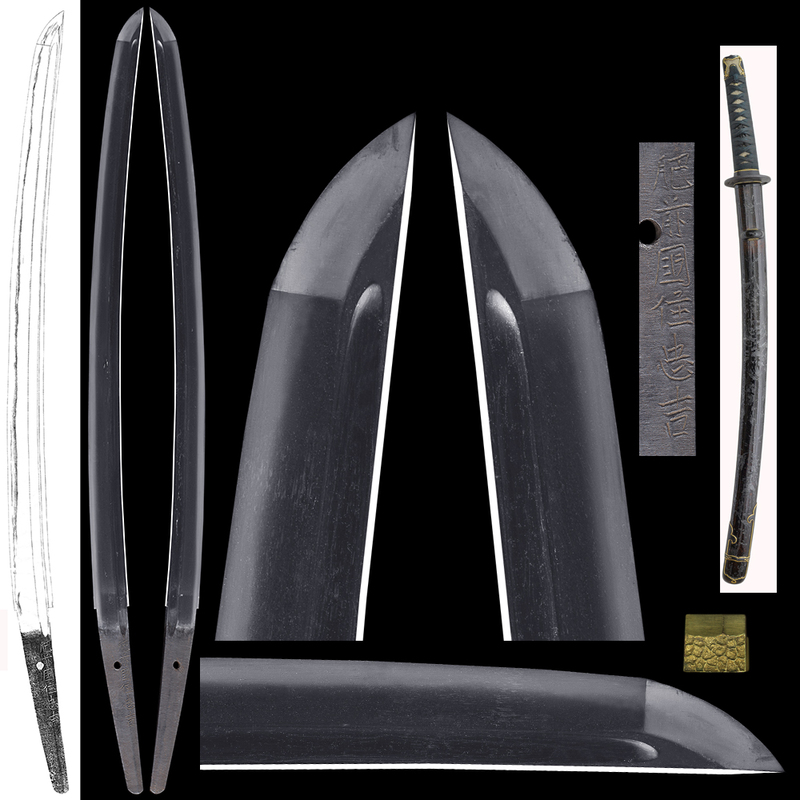 There are bouhi in both sides of the blade. Jitetsu : Clear Koitame-hada well grained with Jinie attached. Hamon : Sudare-Ha or pattern like a bamboo curtain many up and down. This style of Hamon is tripled with splendid Sudare. Boushi turns round shape. Special feature : The first generation Yoshimichi moved to Kyoto with the third son of mino swordsmith Kanemichi. post of Tanba no kami. This third generation Yoshimichi was famous for making Sudareba style through his life. It was quite a challenge to make such Sudareba style Hamon. Both Osaka Tanba school and Kyo Tanba school kept the method secret. 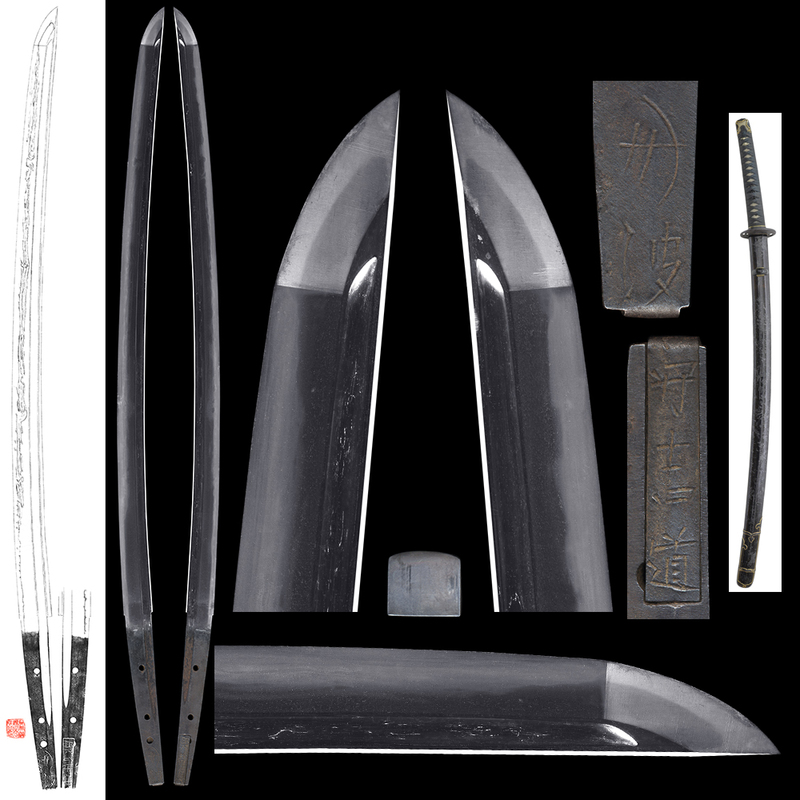 From Edo period to now, many sword smiths have attempted to try Sudare-Ha but all have failed so far. The flamboyant look of Sudare-Ha must have been a pride of family. Koshirae : Issaku Shakudou fine wrinkle style Handachi Koshirae. Tsuba : Round shape iron tsuba with the leaf of engraved openwork. Fuchikashira : Shakudou with fine wrinkle pattern. Saya : Dark brown silver unique saya. Menuki : Shakudou plate with dragon pattern carved. Made at Edo period. Blade length : 52.7 cm or 20.8 inches. Width at the Hamachi : 3.04 cm or 1.2 inches. Kasane : 0.62cm or 0.24 inches. Shape : There are Bohi engraved on both sides of the blade. It is rather wide and thick nice shape. Jitetsu : Itame-hada well grained with Jinie attached. There are some loose hada. Hamon : Nie based Suguha. Nioiguchi is deep with Koashi(legs) mixed. Boushi turns with round end. Special feature : There is a signature that is engraved as Hizenkoku Ju Tadayoshi but unfortunately it is not genuine. From deep Nioi-Kuchi Suguha, it seems to be made by Hojoji school or from Kunikiyo from our view but it is estimated as Houjouji school. Koshirae : This koshriae is Issaku Hantachi koshirae with fine wrinkle texture style. Fuchikashira : Shakudou fine winkle piece. Saya : Dark brown saya in unique pattern. Menuki : On shakudou base dragon design is engraved. It is from Edo period. Kozuka : On shakudou nanakoji base. crawling dragon is engraved and inlayed with gold. Kogatana : Mumei Setsubun (or “the division of season”)design is engraved.